On the Mic with Tim Drake: Slash gets his Star on the Walk Of Fame. Today was a big day in Hollywood as rocker Slash has his Star Ceremony on the Hollywood Walk Of Fame. 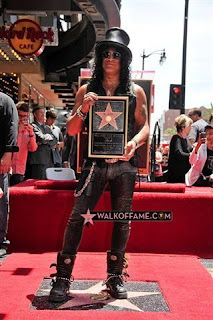 Slash was nominated by actor Clifton Collins Jr. His star has been unveiled in front of the Hard Rock Cafe on Hollywood Blvd. With this star ceremony, Slash has become the first member of the iconic band Guns and Roses to earn a star on the Walk Of Fame. Actor Charlie Sheen, who is a friend of Slash, spoke at the ceremony. Sheen made sure to take his jab at Axel Rose during his remarks by stating "Slash is getting a star on the very street that Axel Rose will one day be sleeping on". Sheen did manage to poke fun at his own problems as well by stating, "That star is going to be stepped on more then the coke we did in the 80's"
Slash shared memories of rehearsing nearby with his former Guns and Roses member Steve Adler. He talked about the times they would ditch school just to be around the scene and take it all in. Following the ceremony, Slash performed a private set inside the Hard Rock that his star will now welcome millions of tourists to every year. Watch the video below for a small look at the ceremony today. Here is a picture of Slash on his star following the ceremony.